Summary: On a morning in 1879, John Watson, M.D., awakes to find the private detective Sherlock Holmes, with whom he shares lodgings at 221-B Baker Street, unexpectedly seated at the breakfast table. Holmes invites Watson to examine a walking stick left behind by an unmet visitor the previous night. What, Holmes wonders, can Watson deduce about the stick’s owner? Watson hazards his observations, only to have them clarified and corrected by Holmes, his deductive superior. Shortly thereafter, the walking stick’s owner, one James Mortimer, M.R.C.S. (Member of the Royal College of Surgeons), arrives. After exclaiming his delight at having the chance to observe Holmes’ skull (for he has heard of the detective’s brilliant intellect), he proceeds to tell Holmes and Watson why he is seeking the master detective’s help. 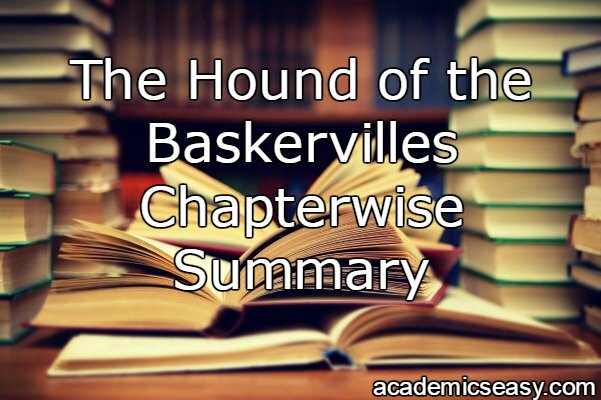 Summary: Mortimer reads to Holmes and Watson an early 18th-century manuscript that tells of how, in the time of the “Great Rebellion” [i.e., 1641-51], Hugo Baskerville, progenitor of the ancient and wealthy Baskerville line and a “wild, profane and godless man,” kidnapped the maiden daughter of a yeoman who held lands near his estate. For this crime, the document claims, Hugo Baskerville died, ravaged by “a great, black beast, shaped like a hound, yet larger than any hound that ever mortal eye has rested upon.” The Baskervilles thus believe a curse has been placed upon their family. Holmes dismisses the story, but is more intrigued when Mortimer reads a recent newspaper account of the death of Sir Charles Baskerville. A generous philanthropist and a potential candidate for Parliament in an upcoming election, Sir Charles (descendant, of course, of the notorious Hugo) had restored much of his famly’s greatness after it had fallen upon hard times by capitalizing on financial speculations in South Africa. A widower, Sir Charles lived only with his servants at Baskerville Hall, a married couple, the Barrymores, who worked as butler and housekeeper. He lived near Mortimer, who was his personal physician; as well as one Mr. Frankland of Lafter Hall and Mr. Stapleton, a naturalist. Sir Charles was keenly interested in the legend of the Baskerville curse, asking Mortimer several times whether he ever saw or heard strange creatures and noises, especially “the baying of a hound.” Each night before retiring to bed, Sir Charles would walk the Hall’s “famous yew alley.” He never returned from that walk on the evening of May 4; at midnight, Mr. Barrymore found his master lying dead at the alley’s end, past its gate that opens onto the moor surrounding the Hall. Sir Charles’ face wore a terrifyingly distorted expression (attributed in the autopsy to cardiac exhaustion). Barrymore noted that the appearance of Sir Charles’ footprints altered once he had passed that gate, but reported no other physical clues to the inquest. Information that the newspaper account does not include, but what Mortimer now tells Holmes, is that, three weeks prior to Sir Charles’ death, Mortimer had visited the nobleman and caught a glimpse of some large, unknown black animal—the sight of which visibly shook Sir Charles. Furthermore, in the yew-alley, Mortimer saw the “fresh and clear” footprints of a gigantic hound. at Waterloo Station upon his arrival, yet not tell him anything of the current situation. Mortimer departs, as does Watson, who knows that his friend needs isolation in which to reflect upon the facts of the case. When Watson returns several hours later, he finds Holmes poring over a topographical map of the Baskerville estate and the surrounding lands. Holmes has also concluded that, contrary to Sir Charles’ usual routine, the squire of Baskerville Hall was waiting at the wicket-gate; and that the shifting shape of Sir Charles’ footprints as reported by Mortimer must be due to the fact that Sir Charles began running away from something in terror. Summary: At ten the next morning, Mortimer arrives at Baker Street with Sir Henry Baskerville, who has already experienced a singular occurrence. Although no one should have known that he had stayed the night at the Northumberland Hotel, he received a letter addressed to him there: a single sheet of paper containing a message composed of words—all but the last one—clipped from a printed source and affixed to the sheet: “As you value your life or your reason keep away from the moor.” To everyone’s astonishment, Holmes immediately identifies the source of the clippings as the lead article from the previous day’s Times. (The word “moor” had to be supplied by hand in ink because it is a less common word.) Holmes further deduces (from the ink splotches, indicative, he says, of a hotel fountain pen) that the sender of the letter assembled it in a hotel near Charing Cross (from the envelope’s postmark). Whether the letter is warning or threat, no one seems sure. Sir Henry is still unaware of the circumstances surrounding Sir Charles’ death; Mortimer gives him the same account he gave Holmes and Watson the previous day. Sir Henry reports that he bought a new pair of boots upon his arrival in London, and, never having worn them, left them outside his hotel room in order to be varnished overnight. That morning, he discovered one of the boots, and one only, had been stolen. Mortimer and Sir Henry begin walking back to the hotel; allowing them a lead of two hundred yards, Holmes and Watson follow them, unbeknownst to the baronet and the physician. Holmes spies a bearded man in a hansom cab also shadowing the pair; unfortunately, the bearded man notices Holmes and Watson in return, and urges his driver to move quickly on, so that Holmes and Watson cannot catch up. They lose the trail of the hansom cab; they lose track of Mortimer and Sir Henry; but Holmes did note the number of the cab (No. 2704). He plans to send a telegram to ascertain the identity of the driver of that cab; meanwhile, he hires a teenager named Cartwright to inspect the garbage from the 23 hotels in the Charing Cross area, looking for a cut-up front page of yesterday’s Times. This evidence, Holmes reasons, will lead them to the person who sent Sir Henry his mysterious letter. Summary: At the Northumberland Hotel, Holmes and Watson find Sir Henry distraught because an old black boot was returned to him in place of the new brown one that was stolen. At lunch, Sir Henry announces his intention to go to Baskerville Hall at the week’s end, a decision Holmes affirms. When Sir Henry asks Holmes to accompany him, Holmes regrets that he cannot, but suggests that Watson go in his stead. Holmes tells Sir Henry and Mortimer that they were followed yesterday; he learns that Barrymore, the butler at Baskerville Hall, has a full, dark beard, as did Sir Henry and Mortimer’s unknown follower. Barrymore and his wife were left £500 each in Sir Charles’ will. Other beneficiaries include £1000 to Mortimer and numerous other individuals and charities. Sir Henry is inheriting £740,000. In all, Sir Charles’ estate is valued “close on to a million.” Holmes learns that, had Sir Henry been unable to inherit the estate, it would have passed to one James Desmond, an elderly clergyman. As the group rises from lunch, Sir Henry spies his missing new brown boot under a cabinet in a corner of the dining room, even though all previous searches had not located it. Summary: Holmes urges Watson to report any even possibly relevant fact about the situation at the Baskerville estate back to him. After eliminating the elderly clergyman Desmond, Holmes enumerates those who live at and around Baskerville Hall whom he does consider suspects in Sir Charles’ death: the Barrymores, Dr. Mortimer and his wife, the naturalist Stapleton and his sister, Mr. Frankland of Lafter Hall and a few other neighbors.” Watson takes a revolver with him. At the platform, Mortimer avers that he and Sir Henry have not been followed again. He says he and the baronet remained together during the previous two days, save for the time Mortimer spent at the Museum of the College of Surgeons and Sir Henry spent in a park (probably Hyde Park, according to Klinger, 462). Sir Henry reports that he never got his other boot back. Holmes urges Sir Henry not to travel the moors alone or at night. The train arrives in Devonshire after only a few hours’ time, and Sir Henry is quite moved by the impressive and imposing sight of Baskerville Hall and its lands, which he has never visited. The company learns that a convict has escaped from the nearby prison at Princetown; armed soldiers keep watch, but the fugitive—the notorious (and possibly insane) Notting Hill murderer, named Selden—has not yet been spotted. Barrymore the butler greets Sir Henry and the others at the Hall, but does announce that he and his wife plan to leave once the Hall’s new master is settled; he says they were greatly devoted to Sir Charles, and cannot stay on comfortably as a result of his death. As Watson tries to sleep that night, he hears the muffled sobbing of a sorrowful woman. Summary: In the morning, Watson learns that the weeping woman he heard the previous night was Mrs. Barrymore, even though her husband denied the fact. He also learns that the telegram Holmes sent from London to Mr. Barrymore was not delivered directly into the butler’s hands, meaning that Barrymore could have been in the city, after all, trailing Sir Henry and Mortimer. While Sir Henry sorts through necessary paperwork, Watson goes walking upon the moor, where he meets the naturalist Jack Stapleton, who lives nearby at Merripit House in the hamlet of Grimpen. His house is an old residence now refurbished for modern living. Mortimer is hunting butterflies, and tells Watson several curious details about the moor, including the fact that the apparently lush and fertile mire around Grimpen is actually a treacherous place, where one “false step… means death to man or beast.” Indeed, the two men watch a pony sucked down into the mire as it attempts to gallop through. The mire has encroached upon the hills over the years, essentially transforming them into highly inaccessible islands; Mortimer, however, goes to the islands to seek his rare specimens. As he is pursuing an especially unusual butterfly, his sister, Beryl Stapleton, approaches Watson and, thinking the doctor is Sir Henry, urges him to return to London as soon as possible. Jack returns and introduces the two; later, Beryl meets Watson on the road back to Baskerville Hall, asking him to forget her warning, which Watson is understandably loathe to do. Beryl tells Watson that she believes in the curse of the Hound, and cannot understand why Sir Henry wishes to place himself in danger. Watson cannot ascertain from Beryl why she could not tell him this in her brother’s hearing; she refuses to elaborate, and returns to Merripit House quickly, before she can be missed. Summary: Watson writes a letter to Holmes, reporting that Selden, the escaped convict, is believed to have left the area entirely. He also reports that Sir Henry has begun to express an attraction to Miss Beryl Stapleton—a development that appears to cause her brother, Jack, some consternation. Watson has also now seen the yew alley, the scene of Sir Charles’ death, for himself; and has met Mr. Frankland of Lafter Hall, an elderly man who spends most of his time filing lawsuits and surveying the moor with a telescope. Sir Henry has asked Barrymore about Holmes’ test telegram from London: Barrymore confirms that the message was not delivered into his hands; he claims his wife—whom Watson thinks aloof and puritanical—brought it to him and relayed his answer. Watson concludes his letter by reporting that, around two o’clock that morning, he saw Barrymore walking stealthily through the corridors and peering out the window onto the moor, impatiently. and Beryl Stapleton’s animated conversation (which he cannot hear) interrupted by Jack Stapleton, brandishing his butterfly net. After more apparently heated conversation, brother and sister leave Sir Henry. Watson reveals himself to the baronet, who tells him that he was in the midst of proposing marriage to Miss Stapleton. Her brother objected, expressing anger with both his sister and Sir Henry. The baronet cannot understand why Beryl’s brother should possibly object to the match. That afternoon, however, Jack Stapleton visits the Hall, explaining that he is simply upset at the thought of losing his sister to marriage after so many years of togetherness. He asks Sir Henry to wait three months before pursuing any more talk of marriage, in order to give him time to acclimate to the idea. Sir Henry agrees. For the next two nights, he and Watson carry out their plan of tracking Barrymore to the window. On the first night, they hear no sound of the butler; on the second, however, they do follow him to the window. They watch as Barrymore holds a candle to it, and see a corresponding, answering light on the moor. When they confront Barrymore, they learn from him and his wife that Eliza Barrymore’s younger brother is none other than the escaped convict, Selden. They had taken him in and cared for him prior to Sir Henry’s arrival at Baskerville Hall; once Sir Henry returned, they arranged to signal him privately, every other night, to see if he needed food and provisions. If he answered their signal, they would set out goods for him. Watson and Sir Henry resolve to capture Selden and turn him in to the authorities. When they reach the light on the moor, however—it is a candle so set in the cleft of a tor (an outcropping of rock formed by weathering, usually located at or near a hill’s summit) that it can only be seen on a direct line-of-sight from the window at which Barrymore stood—they are not able to catch Selden, although they see (presumably) the criminal’s “evil yellow face… all seamed and scored with vile passions.” Selden outruns the two men. They hear a terrible crying sound, the sound Watson has heard once previously and which residents of the moor believe to be the baying of the Baskerville Hound; furthermore, Watson alone catches a glimpse of a man atop the tor a taller man than Selden, standing silent and still. Before Watson can point this mysterious figure out to Sir Henry, the stranger is gone. Watson again writes to Holmes, relating all these events to him and urging him to come quickly to Baskerville Hall. Summary: At breakfast, Barrymore implores Sir Henry and Watson to pursue Selden no more, stating that Selden will shortly be leaving the country, heading to South America where he will trouble England no more. Sir Henry agrees not to inform the police of Selden’s location. In gratitude, Barrymore reveals that, the morning of his death, Sir Charles had received a letter from a woman whose initials were “L.L.” and who lived in nearby Coombe Tracey. The letter-writer asked Sir Charles to meet her at the yew-alley gate that evening, and to burn the letter; Barrymore’s wife only later discovered the charred remnant in Sir Charles’ hearth. The next day, Watson visits the tor where he spied the unknown man the night he and Sir Henry chased Selden. He encounters Mortimer, searching for a lost spaniel (whom Watson fears has been absorbed by the Grimpen Mire). Mortimer tells Watson about Laura Lyons, the daughter of the litigious Mr. Frankland. Laura married an artist who deserted her, and her father has practically disowned her—although Mortimer hints that she may not be without blame in these strained relations. He also states that Selden told him of another man on the moor. He does not know who this man is, but he doesn’t believe he is another convict, nor is he police. He knows, from Selden, that this second man has a “lad” who supplies his wants from Coombe Tracy. Summary: Watson questions Laura Lyons, who reluctantly tells him that she wrote to Sir Charles on the day of his death. Persecuted by her husband and her father (Frankland), she was seeking further assistance toward her financial independence (she has also been receiving help from Stapleton). Mrs. Lyons insists, however, that she never went to Baskerville Hall that day; she claims to have received help from elsewhere, and planned to commence divorce proceedings against her husband, a claim Watson intends to verify—although he must admit to himself that her story hangs together. He still intuits, however, that she may be hiding some truth from him. The doctor then turns his attention to seeking the man he saw on the Black Tor; he receives unexpected help from Frankland, who claims to have seen the messenger boy who takes Selden his food. Watson knows the truth: the boy is supplying food to the unknown man upon the moor, and not to Selden (who has been supplied by the Barrymores). Frankland shows Watson the boy through his telescope, as he is delivering one of his bundles. Watson goes to the same old stone hut as the boy. It is empty at the moment but shows signs of being recently inhabited, chief among them a surprising note: “Dr. Watson has gone to Coombe Tracey.” Watson fears that this stranger is pursuing him rather than Sir Henry until the hut’s inhabitant returns, revealing himself to be none other than Sherlock Holmes. Summary: Once Watson has recovered from the shock of the detective’s self-revelation, Holmes explains that he has not, in fact, been occupied with a blackmail case in London; he has been secretly investigating the Baskerville case on his own. (The boy who has been supplying him is Cartwright, from the telegraph office in London.) Watson tells Holmes about his interview with Laura Lyons; Holmes informs Watson that the woman is intimate with Jack Stapleton, and that Beryl Stapleton is, in fact, Jack’s wife and not his sister. Holmes did not know that Lyons was planning to divorce her husband; he surmises that she planned on marring Stapleton, whom she did not know was already married. Holmes has also concluded that Jack was their mysterious, bearded pursuer in the city, and that Beryl sent Sir Henry the cut-and-paste letter of warning. Holmes and Watson hear a terrible scream; they discover a corpse with an expression of terror on its face whom they initially believe to be Sir Henry, based on its clothing, broken upon a rocky ridge. Upon closer examination, however, they discover that the dead man is Selden. Watson recalls how the Barrymores had given Sir Henry’s old clothes to Selden as part of their support for the fugitive. Holmes deduces that the hound—a real hound, not the Hound of legend—must have been trained to track Sir Henry based upon an item of his clothing (likely the boot stolen from Sir Henry at the hotel in London). Jack Stapleton approaches Holmes and Watson and expresses shock at Selden’ death. He claims to have been concerned for Sir Henry because he had invited the baronet to come to the Stapletons’ home that night, and he never arrived; when he heard the screams, he says, he grew worried. Summary: Holmes instructs Watson to keep all knowledge of the hound that tracked Selden a secret from Sir Henry, in order that the baronet may be better prepared to face dinner with the Stapletons the next evening. Holmes has a plan that hinges upon Sir Henry’s attendance. At Baskerville Hall, Watson tells the Barrymores of Selden’s death; the husband seems relieved, but his wife, Selden’s sister, weeps with grief. While speaking with Sir Henry, Holmes takes notice of the portraits of his ancestors, including a portrait of Hugo Baskerville, who seems, to Holmes’ eyes, “a quiet, meek-mannered man enough,” and not the reprobate of legend whose exploits supposedly brought the curse of the Hound upon his line. When Sir Henry leaves, Holmes points out to Watson how much Stapleton resembles Hugo. Holmes concludes that Stapleton must be, in fact, a member of the Baskerville family, scheming to take Sir Henry’s inheritance. The next morning, Holmes announces that he and Watson will be returning to London prior to the dinner engagement with the Stapletons. Holmes insists that Sir Henry relay the message to the Stapletons that he and Watson hope to return soon, and also to drive to Merripit House but then announce his intention to walk home across the moor, alone, after dinner. Sir Henry does not understand why Holmes is reversing his previous counsel, but agrees to do so. Later, in Coombe Tracey, Holmes instructs young Cartwright to send a telegram in Holmes’ name to Sir Henry, requesting the baronet return a dropped pocketbook by registered mail to Baker Street. When Cartwright returns from the telegram office, he brings a wire from Inspector Lestrade for Holmes, indicating that the police officer is on his way with an unsigned warrant. Holmes and Watson visit Laura Lyons, telling her the truth about Stapleton and learning from her that Jack Stapleton’s dictated the letter she sent to Sir Charles, but also telling her not to keep the appointment with him (protesting that he alone wanted to give her financial assistance, that they might be married). ence in the tin mine where he housed the ferocious animal, but no sign of Stapleton himself. He is presumed to have sunk deep into the miry bog. 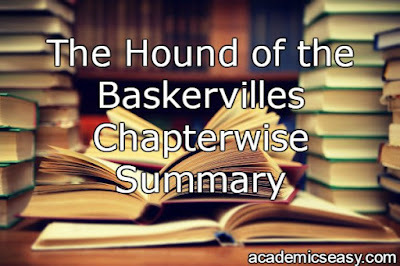 Summary: Some time later, Watson and Holmes review the facts of the Baskerville case. The detective gives final clarification to several points. Stapleton was the son of Sir Charles Baskerville’s brother Rodger, who had fled to South America. After having embezzled public money, Stapleton moved, with his bride Beryl Garcia, to England, where, having changed his name, he established his school (the one true point of his biography that Stapleton had revealed to Watson). Changing his name for the last and final time, he and Beryl moved to Devonshire. Learning that only Sir Charles and Sir Henry stood in the way of his family fortune, he made plans to kill them, using his wife as a decoy and a hidden hound, disguised to look like the Hound of legend, as his weapon. He won the affections of Laura Lyons, whose unkept appointment (at Stapleton’s arranging) with Sir Charles gave Stapleton the chance to unleash the hound upon him. The hound ran on the grass, leaving no tracks behind and thus contributing to the suggestion of a supernatural event. Now turning his attention to Sir Henry, Stapleton took his wife to London with him—not trusting her enough to leave her alone—where he shadowed Mortimer and Sir Henry in his bearded disguise—and where Beryl sent her warning letter to the young baronet, fearing what her husband might do. Stapleton bribed the hotel staff in order to obtain an article of Sir Henry’s clothing, the boot that the hound could use to track the heir. (While Stapleton was in the city, he left the hound in the care of Anthony, an elderly servant who had been connected with Stapleton for several years, since his stay in South America.) Holmes then conducted his secret surveillance of Stapleton, claiming a non-existent blackmailing case demanded his attention; when ready, he revealed himself to Watson, and the case entered its final phase. When Stapleton learned that Beryl knew of Selden’s death and held him responsible, he beat and bound her so that she would have no chance to warn Sir Henry. Holmes regrets having felt compelled to use Sir Henry as “bait,” but takes comfort in the fact that the baronet will recover in time. The case thus satisfactorily resolved, Holmes and Watson prepare for dinner and an evening at the opera.